The Whitehorn Cemetery, located about sixteen miles northeast of Salida, is abandoned. The view across the mesa looking North shows little evidence of the burial site. Closer inspection reveals old boards from picket fences and carefully placed fieldstones at the head of graves. Wild bushes decorate the site. Some graves show ground depressions and the layout follows the traditional pattern of burial with the feet pointing to the East. At least eight graves are placed side by side in a single row running North and South. Additional research will be required to determine the names of all those buried in this lonely cemetery. Access to this site is over private land. However, the cemetery is located on public land in the San Isabel National Forest. 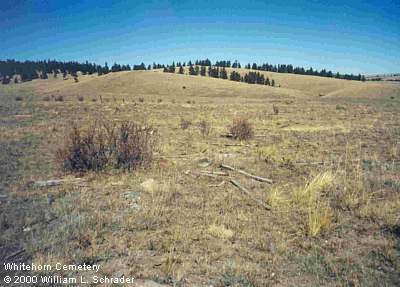 There is a listing of known burials in the Whitehorn Cemetery in the USGenWeb Fremont County Archives. Do you have any headstone photos from other Colorado cemetery to add to the collection? If so, see How To Contribute.